Fionnuala McCormack leads the entry for Sunday's Great Ireland Run in Dublin in an event which will honour the memory of late Ballymena & Antrim athletics club great Sean Kyle. McCormack has travelled home to compete after achieving the Olympic 10,000m qualifying mark in the US last weekend. "The event is a national championship and has a lot of history so I feel it is important to run," said McCormack. This Phoenix Park event is sold out with close to 8,000 runners competing. The mixing of the sport's grassroots and elite athletes is something that would have delighted Ballymena athletics doyen Kyle, who died after a long illness last November. Great Ireland Run organiser, former Irish international athlete Gareth Turnbull came up with of incorporating a team match into the event which would pay tribute to the renowned coach, who formed a remarkable partnership with his wife, the three-time Olympian Maeve Kyle at the Ballymena & Antrim club. The team component will see an Ireland line-up which includes McCormack, facing a Commonwealth select, with the top three scorers in the men's and women's races to count. "Given Sean's background of guiding athletes who competed for Ireland and Britain and in Commonwealth Games, I think a match between Ireland and Commonwealth teams for the Sean Kyle Cup is very appropriate," Turnbull told BBC Sport Northern Ireland. "Maeve (Kyle) is coming down for the event to present the trophy and we're very much looking forward to seeing her." 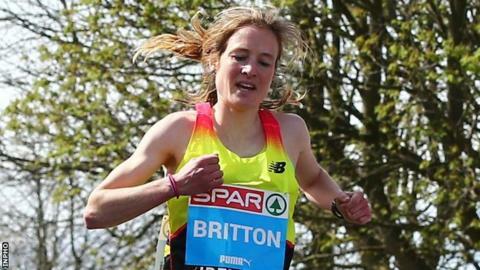 McCormack's Irish women's team-mates will include Deirdre Byrne while Britain's world mountain running silver medallist Emma Clayton and Worthing athlete Rebecca Moore, who has a personal best of 34:27 for 10,000m, will be part of the Commonwealth select. Twice European Cross Country champion McCormack is likely to have to choose either the 10,000m or the marathon in Rio as the events are only two days apart, with the track event taking place first. McCormack appears to be leaning towards opting for the longer distance although she is careful to point out that several other Irish female Olympic hopefuls are set to run marathons over the next few weeks. However, McCormack's marathon time of 2:33:15 set last November, which puts her second fastest of the Irish qualifiers behind Lizzie Lee (2:32:51), is over three minutes faster than next quickest Breege Connolly and is thus, unlikely to be bettered by two Irish athletes over the next month. McCormack clocked 32:05.08 for 10,000m at the Stanford Invitational meeting last Friday which was almost 10 seconds inside the Olympic standard. Olympic Games marathon hopefuls Kevin Seaward and Mick Clohissey will compete on the Irish men's team which also includes Joe Sweeney and Brandon Hargreaves, who represented Ireland at last year's European Under-23 Championships. New Zealander Dan Wallis, who has a personal best of 29:45.47 for 10,000m on the track, will lead the Commonwealth men's team which also includes Englishman Owen Hind and Welsh athlete Rob Samuel. In addition to the elite women's (13:10 BST start) and men's 10K (13:30) races, a Great Ireland Mile featuring Irish talent John Travers will take place earlier in the Phoenix Park at 11:30.